I love a people "who love their neighbors as they love themselves." I love and don't fear mankind where God has made and left them, for they are his children. I love a people who do the best they can. And oh how I love a people who don't live for the love of money. Of Which People Was That Said? The artist George Catlin, who lived for eight years, 1831-1838, among 48 North American Plains Indian tribes, during the pre-"civilization" days. He wrote, in 1841, this short narrative to explain his reason and observations for writing the above creed. "All history goes to prove that when first visited by civilized people, the American Indians have been found friendly and hospitable ---- from the days of Christopher Columbus to the Lewis and Clark expedition ... And so also have a great many travelers, including myself: Nowhere to my knowledge, have they stolen a six-pence worth of my property, though in their country there are no laws to punish for theft. 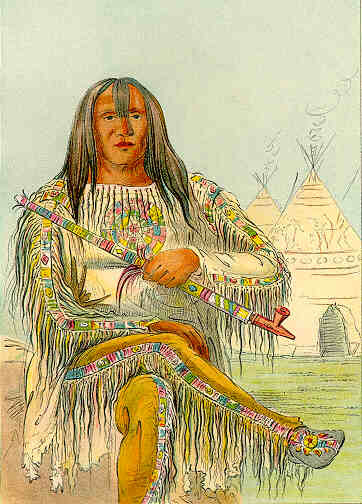 I have visited 48 different tribes, and feel authorized to say that the North American Indian in his native state is honest, hospitable, faithful, brave,... and an honorable and religious human being..."
The First Letter To Europe About These People So tractable, so peaceable, are these people that I swear to your Majesties there is not in the world a better nation. They love their neighbors as themselves, and their discourse is ever sweet and gentle, and accompanied with a smile, and though it is true that they are naked, yet their manners are decorous and praiseworthy. In most pre-Columbus American cultures, the political structure resembled a democratic society. In contrast, Christian Europe was a feudal system with an economic class, controlled by the tyrannic church.... -- Dave Fisher, "Violent Christian Europe vs. the Americas"
Does this sound like the situation with the native peoples around the world today in 2002?? That they will retaliate for the injustices done them? In Agrarian Justice, Thomas Paine returned once again to the Iroquois, among whom he had learned democracy, when he wrote, "The fact is, that the condition of millions, in every country in Europe, is far worse than if they had been born before civilization began, or had been born among the Indians of North-America at the present day." However, the Christian leaders didn't like the idea that some of their people would favor a "heathen" life like this. One without the hatred, racism, and malice towards others, even towards those within the same community. Therefore, laws were made to control people with fear if they chose to live a life filled with love. The penalty was, of course, severe for those who sought to leave the evils of Christian settlements. They were hunted down, caught, and faced many different forms of punishment, depending on how religious the Christians felt. They could be flogged, shot, or burned alive. -- "The Christian Invasion of North America by the English"
Our Creator put us on this wide, rich land, and told us we were free to go where the game was, where the soil was good for planting. That was our state of true happiness. We did not have to beg for anything. Our Creator had taught us how to find and make everything we needed, from trees and plants and animals and stone. We lived in bark, and we wore only the skins of animals. Our Creator taught us how to use fire, in living, and in sacred ceremonies. He taught us how to heal with barks and roots, and how to make sweet foods with berries and fruits, with papaws and the water of the maple tree. Our Creator gave us tobacco, and said, Send your prayers up to me on its fragrant smoke. Our Creator taught us how to enjoy loving our mates, and gave us laws to live by, so that we would not bother each other, but help each other. Our Creator sang to us in the wind and the running water, in the bird songs, in children's laughter, and taught us music. And we listened, and our stomachs were never dirty and never troubled us. Thus were we created. Thus we lived for a long time, proud and happy. We had never eaten pig meat, nor tasted the poison called whiskey, nor worn wool from sheep, nor struck fire or dug earth with steel, nor cooked in iron, nor hunted and fought with loud guns, nor ever had diseases which soured our blood or rotted our organs. We were pure, so we were strong and happy. But, beyond the Great Sunrise Water, there lived a people who had iron, and those dirty and unnatural things, who seethed with diseases, who fought to death over the names of their gods! They had so crowded and befouled their own island that they fled from it, because excrement and carrion were up to their knees. They came to our island. Our Singers had warned us that a pale people would come across the Great Water and try to destroy us, but we forgot. The North American Indian is everywhere, in his native state, a highly moral and religious being, endowed by his Maker with an intuitive knowledge of some great Author of his being, and the Universe, in dread of whose displeasure he constantly lives, with the apprehension before him of a future state, where he expects to be rewarded or punished according to the merits he has gained or forfeited in this world. Morality and virtue I venture to say the civilized world need not undertake to teach them. I never saw any other people of any color who spend so much of their lives in humbling themselves before and worshipping the Great Spirit. -- Catlin's "N. A. Indian," Vol. II., p. 243. One great difference in our ways is that, like the early Christians, the Indian was a socialist. The tribe claimed the ground, the rivers and the game; only personal property was owned by the individual, and even that, it was considered a shame to greatly increase. For they held that greed grew into crime, and much property made men forget the poor. Our answer to this is that without great property, that is, power in the hands of one man, most of the great business enterprises of the world could not have been; especially enterprises that required the prompt action impossible in a national commission. All great steps in national progress have been through some one man, to whom the light came, and to whom our system gave the power to realize his idea. The Indian's answer is, that all good things would have been established by the nation as it needed them; anything coming sooner comes too soon. The price of a very rich man is many poor ones, and peace of mind is worth more than railways and skyscrapers. In the Indian life there was no great wealth, so also poverty and starvation were unknown, excepting under the blight of national disaster, against which no system can insure. Without a thought of shame or mendicancy, the young, helpless and aged all were cared for by the nation that, in the days of their strength, they were taught and eager to serve. Thus: Avarice, said to be the root of all evil, and the dominant characteristic of the [European] races, was unknown among Indians, indeed it was made impossible by the system they had developed. They spoke very loudly when they said their laws were made for everybody; but we soon learned that although they expected us to keep them, they thought nothing of breaking them themselves. Their Wise Ones said we might have their religion, but when we tried to understand it we found that there were too many kinds of religion among white men for us to understand, and that scarcely any two white men agreed which was the right one to learn. For a long time Native Americans have been rebuking textbook authors for reserving the adjective "civilized" for European cultures. In 1927 an organization of Native leaders called the Grand Council Fire of American Indians criticized textbooks as "unjust to the life of our people." They went on to ask, "What is civilization? Its marks are a noble religion and philosophy, original arts, stirring music, rich story and legend. We had these. Then we were not savages, but a civilized race." Even an appreciative treatment of Native cultures reinforces ethnocentrism so long as it does not challenge the primitive-to-civilized continuum. This continuum inevitably conflates the meaning of civilized in everyday conversation - "refined or enlightened" - with "having a complex division of labor," the only definition that anthropologists defend. When we consider the continuum carefully, it immediately becomes problematic. Was the Third Reich civilized, for instance? Most anthropologists would answer yes. In what ways do we prefer the civilized Third Reich to the more primitive Arawak nation that Columbus encountered? If we refuse to label the Third Reich civilized, are we not using the term to imply a certain comity? If so, we must consider the Arawaks civilized, and we must also consider Columbus and his Spaniards primitive if not savage. How Many Millions have been barbarously murdered in the name of God and "Civilization" in the last 100 years, let alone the last 500. "Why Have Our Teachers Lied To Us?" They are vassals of the Law and Live in Fear. if they choose to live a life filled with love. There are no political or religious solutions to spiritual problems. Ho mitakuye oyasin, Hetch etu aloh..!! All my relatives, It is indeed so..! !